On March 21, 2018, at approximately 2:45 pm, Headingley RCMP received a report that two RM of MacDonald bylaw officer vehicles had been rammed by a front-end loader at Samborski Environmental on Brady Road. The report indicated that the loader had left the scene and was heading east on the Perimeter Highway, driving in a manner that was dangerous to the public. Officers attended immediately. As the front-end loader exited onto Pembina, it was pulled over near Bishop Grandin by Winnipeg Police Service officers without incident. 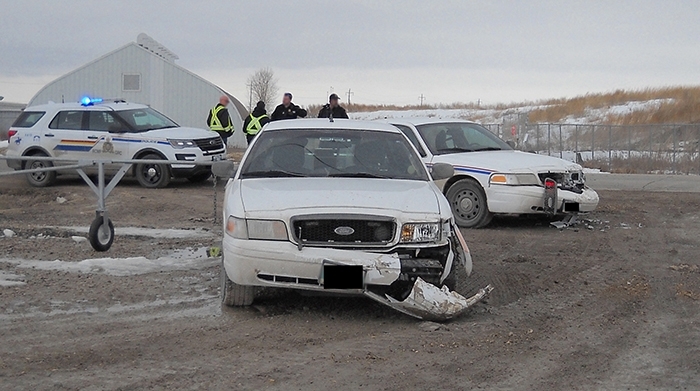 RCMP officers took the driver, Leonard Samborski, 65, of Winnipeg into custody. The investigation has determined that the bylaw officers from the RM of MacDonald were executing a seizure warrant related to a breach of municipal bylaw at Samborski Environmental at the time of the incident. Two bylaw vehicles had partially blocked the driveway of the business while the bylaw officers attempted to seize the front-end loader. Samborski rammed the front-end loader into the two bylaw vehicles and exited the property. One bylaw officer sustained non-life threatening injuries as he exited the vehicle through the passenger side door while the vehicle was being rammed. The other officer was uninjured. Samborski has been charged with Resisting/Obstructing a Peace Officer, Dangerous Operation of a Motor Vehicle, Mischief Over $5000 x2, Assault on a Peace Officer x3, Fail to Stop at Scene of Collision, and Flight from Peace Officer While Pursued. He has been released.